Antonia Sellbach is a Melbourne based artist. Her work explores abstraction in relation to thought, sensation, language and serial decision-making. Often modular in nature, Sellbach’s work creates partitions and parts, sets and versions, work made to be configured and re-configured. Sellbach is currently completing a practice-led PhD exploring the connections between Wittgenstein’s concept of Language Games and Abstraction. 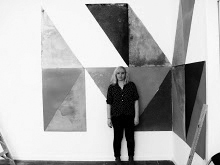 Antonia Sellbach is also a musician with Melbourne bands Love of Diagrams and Beaches. She has worked as a professional grant writer and as a peer assessor for the Australia Council for the Arts on their Music Board. She is on the Board of Directors for LISTEN, a feminist collective that seeks to gain further visibility for women within the Australian Music Underground. She is currently a creative arts lecturer at Melbourne Polytechnic.